Luxivair SBD has announced a strategic partnership with Jetex Flight Support to provide world-class services to Jetex customers when they enter Southern California. Jetex has operations in over thirty countries and the agreement with Luxivair SBD is the first of its kind in the United States. The partnership was announced recently at the National Business Aviation Association Schedulers and Dispatchers Conference. Luxivair SBD is located at San Bernardino International Airport about 60 miles east of Los Angeles. Jetex customers entering through Luxivair SBD can avoid the congested airspace at other overcrowded airports, yet have access to most Southern California attractions within an hour’s drive. International customers also have access to on-site Customs clearance for their convenience. Jetex is a recognized world leader in executive aviation and can deliver best-in-class trip support to customers worldwide. It provides the pinnacle in FBO facilities—aircraft fueling, ground services, and trip planning for their elite clientele utilizing corporate, commercial, or private aircraft. 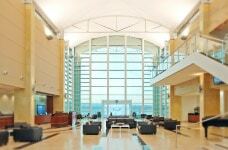 Luxivair SBD is an exceptional FBO—its distinct 12,000 square foot terminal with its stunning glass-enclosed two-story atrium lobby, includes a conference room, pilots’ lounge, snooze room, theater and ramp-side vehicle access. Luxivair SBD can also provide aircraft storage and service with its efficient aircraft support services partners located at the airport. Visit https://www.luxivairsbd.com to learn more about the world-class services available at Luxivair SBD.